Craig Wighton insists he is ready to plug the gap left by Steven Naismith in Craig Levein’s Hearts line-up. Jambos fans fear they may have seen the last of on-loan Norwich forward Naismith after it was confirmed he faces up to 10 weeks out having been sent for knee surgery. But the timing has worked in Wighton’s favour as he prepares to make his own return from a two-month lay-off with an ankle injury. 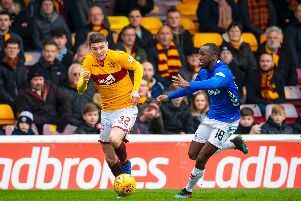 Wighton knows just how important the former Kilmarnock, Rangers and Everton star has been for Hearts this season. But he believes he can step into the 32-year-old’s shoes and ensure the Jambos do not stumble like they did when Naismith spent eight weeks out earlier this campaign. Now the former Dundee youngster has pleaded with Levein to let him take the Scotland international’s jersey when Hearts make the trip to Dens Park to take on his former side on Saturday. The 21-year-old said: “You don’t even have to look at what Steven has achieved in his career, he’s done so much even this season for us with the amount of goals he’s got. “It’s a big task for everyone, all the forwards, to replace that. “We missed Steven the last time he was out so it’s up to us to step up. “We’ve got other good players in Uche Ikpeazu, Steven MacLean, David Vanecek and now Aidan Keena too, so there’s a lot of competition even without ‘Naisy’. “Obviously he’ll be a miss. Any team would miss a player like that. “But I’ve got to believe I can step into his shoes. All the forwards have got to think like that. Wighton is yet to open his Hearts account as his first six months in Edinburgh were hampered by injury. Now he is back to full fitness, the Scotland Under-21 frontman is desperate to get off the mark. And he warned his former Dark Blues paymasters he will not let his old loyalties get in his way if he is given the nod to take on Jim McIntyre’s side. “It feels a bit like a fresh start now that I’m injury free,” said Wighton, who clinched a £100,000 switch from Tayside back in August. “I actually feel that I’m in better shape now than when I first came to the club. “I’ve had a few games back-to-back in the reserves. Even though it’s not first-team level it’s good to get them under my belt as I’ve not had that for a while. “I’m feeling sharp and if I do get called upon this weekend I’ll be ready. “Hopefully I can open my account. That’s the most frustrating thing when you don’t score after moving to a new club. When you do get the first and are off the mark, it’s a bit of a relief. “I’ve not played many games but it’s up to me when I do get back in the side to take my opportunities. “I’m a Hearts player and I’m looking to open my account, so it doesn’t matter who it’s against. It’s irrelevant.